Measure Your Website Speed. Objectively. Measure Your Website Speed There are many subjective things on developing new website, like colors, fonts and layouts. At same time, other important qualities, like loading time, are objectively measurable. Let's tune also your website and get it perform faster! Measure Your Website Speed. Objectively. There are many subjective things on developing new website, like colors, fonts and layouts. At same time, other important qualities, like loading time, are objectively measurable. As we saw on page "Fast website", there are two advantages of faster website; visitors get better browsing experience and search engines praise with higher rankings. To check how well optimized your website is, go to pingdom.com speed testing tool and enter your website address to the URL field there. Pingdom speed testing tool checks the load time of your website, measured in seconds. Below 0,5 seconds - top performer, gratulations! If your website loads slower than 0,5 seconds, you might be interested about reading the article "7 Principles of fast website", where you will get idea, what are common mistakes what make it most probably slow down. In case your website is made years ago and needs new design as well as modern and faster platform, go to "Ask a Quote" page and just send us a line. 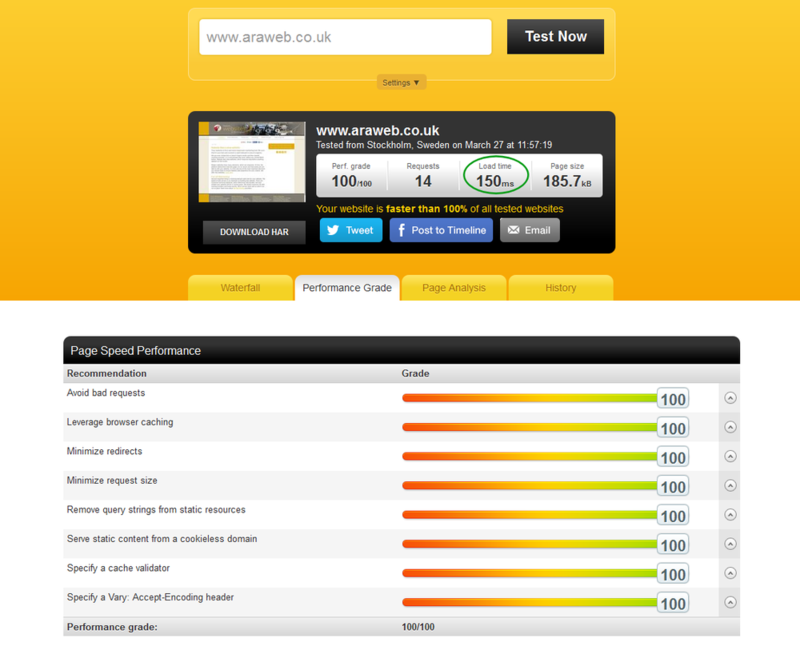 If you would like to have website performing faster, think about hiring us. 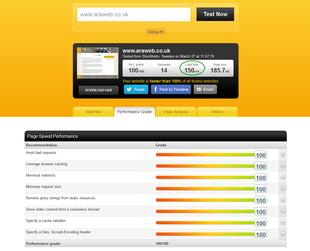 Just for setting benchmark, our website loads with only 0,150 seconds and gets Pingdom performance score 100. Let's tune also your website and get it perform faster! As we saw on page " Fast website ", there are two advantages of faster website; visitors get better browsing experience and search engines praise with higher rankings To check how well optimized your website is, go to pingdom There are many subjective things on developing new website, like colors, fonts and layouts. At same time, other important qualities, like loading time, are objectively measurable.